Hyperopia, also known as farsightedness, longsightedness or hypermetropia, is a refractive error (vision defect) of the eye in which with accommodation completely relaxed, parallel light rays entering the eye come to a focus behind the retina, instead of directly on it, creating a blurred image. In the farsightedness eye, the eyeball is too long or the cornea is too flat (has less curvature). As a result, the light entering the eye is not focused correctly and near objects look blurred. Farsighted persons usually have trouble seeing objects that are close to them. They also complain of difficulty in concentrating and maintaining a clear focus on near objects and frequent headaches after performing close work. In young age, farsightedness gives rise to no symptoms because the natural accommodation of the eye is strong, correcting mild to moderate degrees of farsightedness. As age advances the power of accommodation becomes less, the farsighted person starts to find difficulty in seeing first close objects, and later both close and far objects. 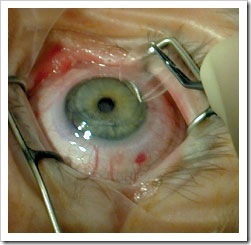 Axial hyperopia is due to a short axial length of the eye. 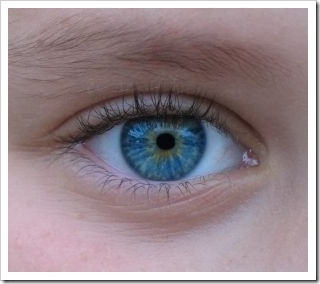 Children are born with small eyes, thus they have axial hyperopia (average 3 D ). As the eyes grow they become less hyperopic, till they become emmetropic. If the eye does not reach the proper length, hyperopia will remain. If the eye grows more than normal, myopia will result. Curvature hyperopia is attributed to decreased curvature (flattening) of one or more of the refractive surfaces of the eye, especially the cornea. Index hyperopia is attributed to decrease in the index of refraction of one or more of the ocular media, especially the lens. Hyperopia is detected with a vision test and refraction performed by ophthalmologists or optometrists. It is measured in dioptres by the strength or optical power of a corrective lens that focuses distant images on the retina. Farsighted persons may also have some degree of astigmatism, which can also cause blurring of vision. The treatment for hyperopia depends on several factors such as the patient’s age, activities, and occupation. Minor amounts of hyperopia are occasionally left uncorrected; however, larger amounts may be corrected with convex lenses in eyeglasses or contact lenses. Convex lenses have a positive dioptric value, which causes the light to focus closer than its normal range. Refractive surgery procedures such as LASIK is another option for adults suffering from hyperopia and wish to see clearly without glasses.